Sony Xperia Z1 overview: Serious challenger to Nokia Lumia 1020? Sony’s Xperia Z1 is the flagship model adopting a physically larger 1/2.3-inch type CMOS sensor with 20.7M pixel count. It also features a Sony G type lens promising high picture quality, but is it enough to compete with rivals such as the latest Apple iPhone 5S and the 41-Mpix Nokia Lumia 1020? Read on to see how well it fares using our usual industry-standard tests. With a DxOMark Mobile score of 76 points, the Sony Xperia Z1 is tied in second place with the the Apple iPhone 5s. It narrowly misses out on the coveted top spot, which is still occupied by last year’s technological wonder, the 41-Mpix Nokia 808 Pureview at 77 points. 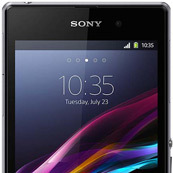 Hot on the heels of the firm’s high-end Xperia Z launched at the beginning of the year at CES comes the Z1, an Android 4.2 powered smartphone with a larger than average 1/2.3-inch type CMOS sensor. It has an impressive 20.7M pixel count and is combined with a high-quality Sony f/2.0 G-type lens. As with earlier offerings from Sony, particularly the Xperia Z, it’s all housed in a sleek, angular waterproof shell. It has fast and accurate autofocus under a wide range of conditions and images retain high levels of detail, even at the lower 8-Mpix setting. Noise levels are low under various lighting conditions with very little of the distracting chroma-type noise. The Z1 is ranked 5th for stills behind the Nokia 808 Pureview, iPhone 5, Nokia Lumia 1020 and the Samsung Galaxy S4. The video score is the best we’ve seen from a camera phone and ranks 2nd in our database behind the GoPro Hero3 which is an action-camera. Excellent detail preservation outdoors (better than other 8-Mpix cameras). Low noise level in all situations. Noise is not unpleasant (no chroma component) with a very small grain size. Good autofocus: fast and precise in most situations. Good flash; precise autofocus, good exposure, good color rendering and white balance, good detail preservation. Good noise reduction, especially in low-light conditions. Slight color shading occasionally noticeable. Excessive exposure time under 20 lux (beneath 1/10s where rivals stop at 1/15s), and possible source of motion blur. Low-contrast details smoothed slightly in low light conditions. Residual high-frequency motion visible in indoor conditions from walking movements.